Over the course of my four years at Stanford, the Catholic Community at Stanford has been a source of spiritual nourishment, warm community, and genuine mentorship. I feel God's presence when I am sitting in Memorial Church and hearing Father Xavier’s and Father Emmanuel’s homilies. On Tuesday nights at Old Union, I especially feel God's presence when I am at adoration gazing at the monstrance. I feel God's presence when I am holding hands with the ladies in my Catholic small group and am asking the Lord's intercession for our intentions. And I feel God's presence when I attend activities such as the Special Dinner when students of different years gather for food and fellowship. In particular, I am blessed to have had the opportunity to draw closer to Christ through the weekend silent retreat in March at the San Jose Mission of the Dominican Sisters. During the guided silent retreat, I joined other undergraduates, graduates, and permanent community members for a weekend of prayer, spiritual direction, and the Eucharist. In between spiritual direction sessions with Lourdes Alonso, I frequently explored the beautiful grounds. The retreat allowed me to find God in the silence of nature. In this off-campus retreat, I was able to better understand the verse from Matthew 11:38: "Come to me, all you who are weary and burdened, and I will give you rest." God calls each of us into a closer relationship with Him, but sometimes we need some silence to hear His invitation. As students with demanding schedules, it is difficult to hear His call, let alone respond to it. I see Jesus as a gentleman who is standing outside the doors of our hearts, knocking and waiting to be invited in. We must open the door to our hearts to let Him in. Normally, I maintain a Google calendar that is like a jam packed Tetris board and every day I am bombarded by texts, emails, Facebook notifications, etc. Such intrusions do not exist in the peaceful refuge of the silent retreat. At last, in the quaint gardens in front of the retreat house, I could clear my mind. I reflected on my many blessings-- my loving family with five other siblings, my exceptional educational experience, and all the friends, mentors, and communities that supported me throughout my undergraduate journey. The sense of peace and joy emanated from a strong sense of God's loving presence. Lourdes encouraged me to journal about these moments so that I could return to them when life got busy again. Another aspect of the retreat was Ignatian discernment which guides us to reflect on our present circumstances so that we can be aware of what God is calling us to do. 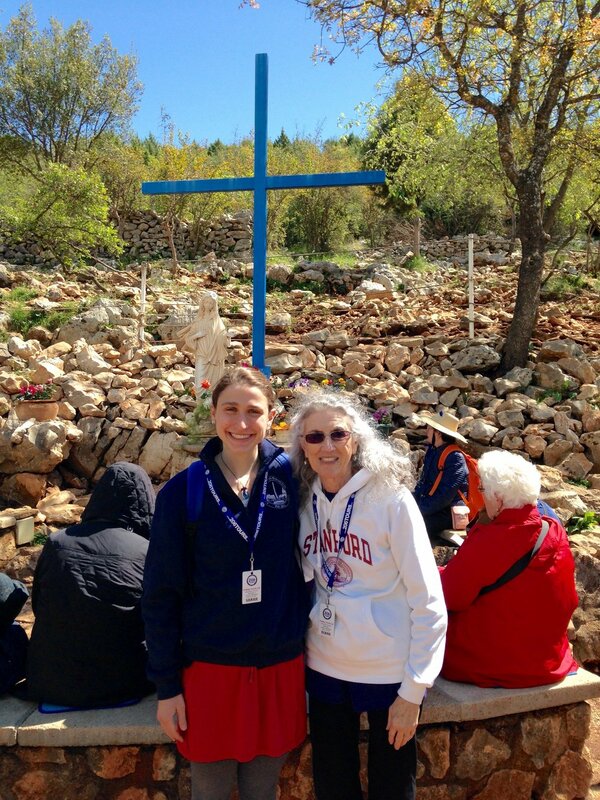 After prayerful reflection, I felt the Lord was calling me to use my final spring quarter (since I had completed all course requirements for graduation) to go on a Marian pilgrimage with my maternal grandmother to Lourdes and Medjugorje. As I write this reflection, I am happy to report that we have just returned from a ten-day experience of a little taste of heaven on earth. So thank you to the Catholic Community at Stanford for your friendship, support, and encouragement. I look forward to seeing everyone at graduation and staying in touch during the years to come!